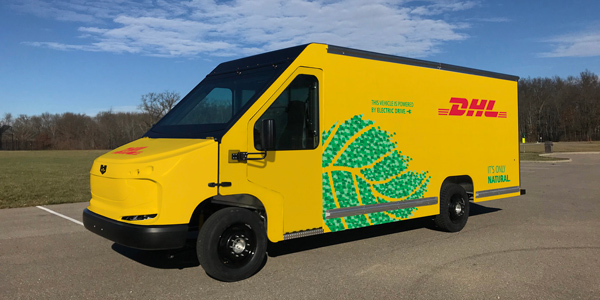 DHL announced that it will be rolling out a new fleet of 63 electric delivery vans from Workhorse Group that will serve U.S. markets. The Workhorse Group electric vans are capable of running up to 100 miles on a charge, the vans have ultra-low floors to reduce physical stress on workers’ knees and back, and a high roof design that maximizes cargo space in a small footprint (1,008 cu ft of cargo capacity), according to the manufacturer. DHL will roll out the first 30 NGEN-1000 electric delivery cargo vans in the San Francisco Bay Area. DHL has set a target of operating 70% of first- and last-mile delivery services with clean transport modes by 2025 as part of its longer-term corporate commitment to reduce its logistics-related emissions to zero by 2050.